You can add to the collection of Bristol Bay place names by conducting Elder interviews or reviewing archived documents or audio collections. This is a great way for student groups to make connections with Elders and have lasting impact. Small grant opportunities exist to help with potential expenses. Other grants or organizations that may support place names projects, please have a look on our resources page for information and links. 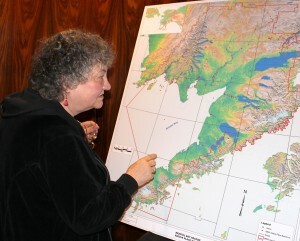 Gayle Miller, director of academic programs for the Lower Kuskokwim School District, studies a map of Bristol Bay place names during a break at the Alaska Native Place Names Workshop, Anchorage, Alaska, 2015.